The hull construction is from a female mold, hand laid up, using appropriate layers of matte, cloth and woven roving with resin. There is a gel coat finish on the exterior portions of the hull. The deck and superstructure are of the same type of construction; however, they are cored and have a nonskid pattern on the walking surfaces. 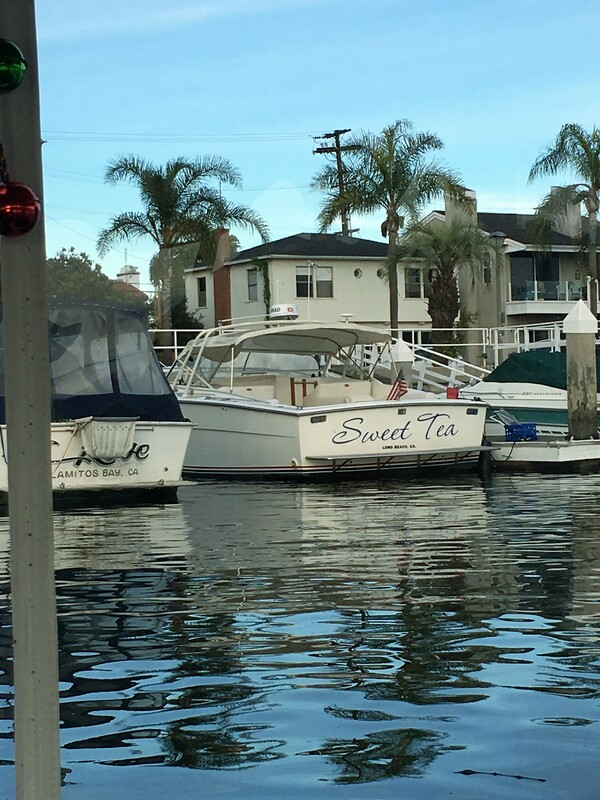 There is also a marine enamel paint finish on portions of the exterior of the vessel. 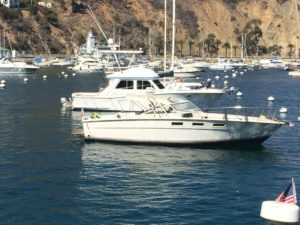 There are transverse plywood bulkheads, intermittent framing and longitudinal stringers along with a deck-to-hull joint that gives the vessel its rigidity and stiffness. The operations center is at the helm console on the forward port side of the cockpit. There is adequate instrumentation for monitoring the engines, in the adjacent area. There is a foam and vinyl bench helm seat as well as a bench companion seat. The cockpit sole has been overlaid with teak. There are hatches in the cockpit sole giving access to the main engines. The potable water tank, holding tank, batteries, water heater and fuel tanks are also located here. 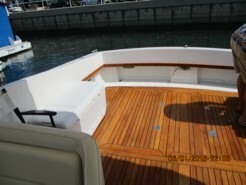 There is a deck on the port and starboard sides of the cockpit and windshield leading forward for fishing, anchoring and other uses. There is a large, flat cabin top/deck with one (1) cabin top hatch providing light and air to the cabin below. 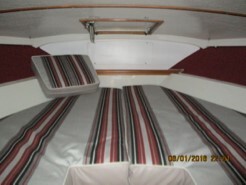 The cockpit is protected with a canvas bimini top with stainless steel bows, and an aluminum and tempered glass windshield. 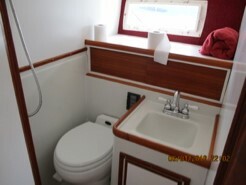 Entering the main cabin through a companionway hatch on centerline in the forward area of the cockpit and down a set of stairs, there is an enclosed marine toilet and shower to port. To starboard is a convertible dinette and a small galley area forward of the dinette. 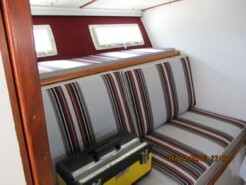 On the port side, opposite the galley, there is sofa type seating that converts to over/under berths. Continuing forward, there is a double berth in the “V” of the hull. There is a chain locker located in the forepeak. Throughout the vessel there are various hanging lockers, cupboards, drawers and storage areas.